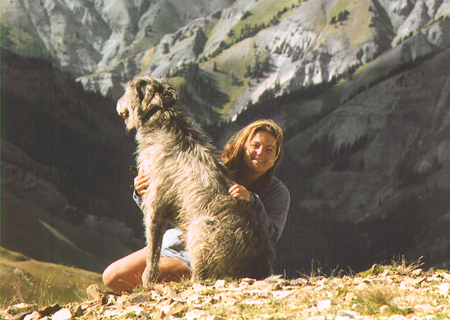 Pam and Dante in the San Juan Mountains, CO.
Pam Houston, known for her cowboy-loving and adventure-seeking novels, lives in her own paradise on this remote Colorado ranch at 9,000 feet near the headwaters of the Rio Grande. And she brings that natural world with her wherever she goes. 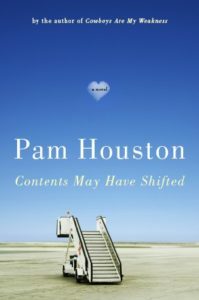 She recently kicked off the book tour for her new novel, Contents May Have Shifted, and I had the pleasure of interviewing her before her talk at Book Passage, in Corte Madera, CA. EYE: Contents is such a fascinating novel that unravels a story about a Pam who is on a spiritual journey looking for love and freedom. I’m sure many people are asking what was behind your decision to use your name as the narrator in the book? PAM: Yes, that’s what I will be speaking to for the next six weeks on this tour…[laughs] and I don’t mind at all. I’ll say up front that I wrote an essay called “Corn Maze” to accompany this book, so if you want a real articulate and thought-through answer, I recommend reading that essay. EYE: I read it so I can vouch for it being very insightful. Like all your books, Contents is such an honest, revealing look at your life. I can see that you didn’t arrive at the choice easily. PAM: It’s me thinking very deeply for about six months about that question. I’ve always believed it’s my job to go out into the world and pay really strict attention to the stuff that happens to me and the people around me. That’s what my writer’s job is—that’s my practice. Then I come back, and the stuff that has some sort of emotional, metaphorical, structural resonance is what I write down. It is so obvious for me to write autobiographically and then to shape it into a story where it doesn’t necessarily correspond exactly to what really happened. It’s like breathing or eating. That’s what I do; it’s what I’ve done in all my books. In Sight Hound, my name was Ray. In Waltzing the Cat, my name was Lucy. EYE: So why does it say novel on the cover? PAM: The truth is we had this cover without the heart cloud, and we all really liked it a lot, but I thought it was a little cold. And then they put the heart cloud on it. We liked it a lot better because it warmed it up, but we thought maybe it was too sentimental. But if the cloud was doing something, like holding the words “a novel,” it cut down on the sentimentality. That’s how we got to that. It was an artistic choice. It was going to be shelved in the novel section anyway because I made stuff up, and a lot of it was practical concerns. One character, Nora, is an amalgamation of three women because there were too many to keep track of. Some of it was protecting people who didn’t want to be written about so I fictionalized them radically. I don’t really believe in non-fiction. EYE: Really? You’ll have to clarify that for us. PAM: I hate to say that because it pisses off half the audience. I love memoirs, and there are books of non-fiction that are truly important to me. I’m really glad those people do believe in non-fiction. And, of course, one of my books is called non-fiction. But for me, I just want to tell my story. It happens that my father broke my leg, but it doesn’t matter to me if you think that. I don’t want you to be moved because my father broke my leg. That’s true, but I want you to moved because that father, who has a different name than my father, broke that Pam’s leg. PAM: Well, I realize I’m playing a game with that name, but it’s a serious game. I grew up with The Things They Carried. This was a very, very important book when I was leaning to be a writer. 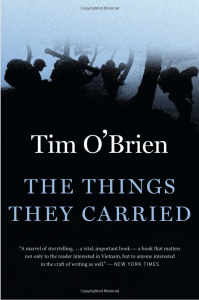 And in that book, which is not called anything but it is shelved in fiction, Tim O’Brien calls himself Tim O’Brien, so this is an homage to that decision. I’m not the first person to make it. And there’s more. I grew up in a family where you could never say how things really happened. 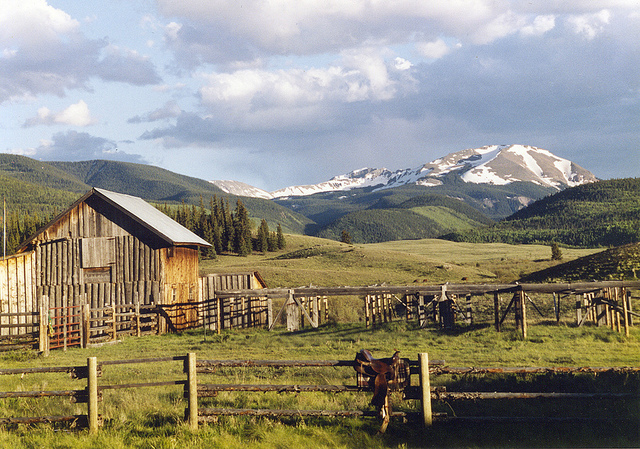 This is where I want to be; this is what I want to write about. I was really torn at the end after all the meetings with lawyers and the legal readings that were always so stressful, so I called my wonderful, wonderful editor, Alane. I said, “Should I just give up? Should I just call myself Melinda?” And she said, “We want them to think it’s Pam, and it’s not Pam,” and I wept. Honestly, it was so moving to me to be understood at that level by this person since my long time editor passed away. EYE: Thank you. That makes a lot of sense to me. I want to ask you about believing in life signs that let you know you’re on the right path. I wrote a blog post on this, and I know this resonates with you having had encounters with the famous author Carlos Casteneda walking up to you randomly at LAX and actor William Hurt appearing out of thin air. Tell me about your life signs and William. PAM: Well, I believe that I’m looked after…and I don’t mean more than most people or less than most people. And when life signs show up, they’re always a gift. Sometimes they don’t seem like a gift [laughs]; sometimes they seem like a problem. I do believe that people—or things or animals or massage therapists—come to me to really help me in a BIG way, and if I can stay open to that it’ll work. EYE: Well, I just love your chance encounter with William Hurt. If that had happened to me, I think I would’ve just started running! PAM: [laughs] That was really something. My student was with me, and he just went pale. We were talking about Hurt. I had just finished saying “William Hurt,” and he walked in. And we were nowhere…in northern California on the I-5, a hundred miles north of here before you get to Redding at this crappy little roadside place where you buy olives. It was so weird…and cool. EYE: And he was wearing white? PAM: …he had been at an ashram. He had just come from meditation, so he was in all white flowery clothes. EYE: You sure did…very cool. Now let’s talk about technology and writing. This next generation of novelists only knows a world of instant everything–texting, tweeting and posting. What do you think of social media? 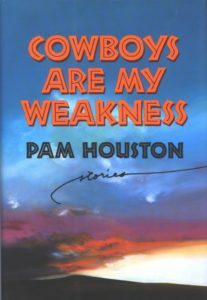 PAM: Basically W. W. Norton, my publisher, said, “It’d be good if you learned to use Facebook in the next two months,” [laughs] and I’m so new to that world. I’m in the honeymoon stage, and I’m enjoying it. It’s fun. I’m doing Facebook and Twitter, and it’s also fun at the eve of this tour because I’m getting to act on my own behalf in a way I’m not used to. Instead of thinking, “Oh I wonder if the publicist is doing that,” it’s a way to take part in this part of the process. It appeals to me ’cause —like all writers—I’m kind of a control freak. I did it absolutely kicking and screaming, and I’m so surprised at how much I like it. But a couple of things have happened. 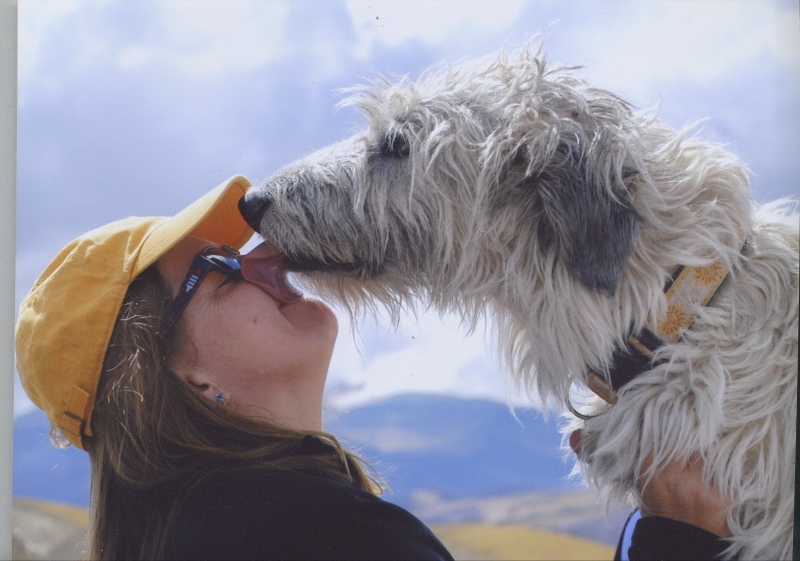 I have a very sick puppy right now and the love on Facebook from strangers who are all wanting my puppy, a nine-month-old Irish wolfhound, to get well IS AMAZING. EYE: You should get your puppy a Facebook page. He’ll end up with more friends than you! PAM: [laughs] Yeah, I know. It’s true, it’s true…so I probably will do that when things settle down. I think he’s going to be OK. Anyway, there’s so much love on FB, and it may be in a certain way artificial, but let’s not split hairs. It’s lovely to have all those people caring about my dog. EYE: You’re having to bridge that gap between the concrete world and cyberspace…that’s not always easy. PAM: No, it’s not since when I’m online, I’m not in the present moment, not out in the concrete physical world where I make my living. I am an observer of that world. I collect stuff and then I come home and I write it down, so I was so against it for myself, not for other people. Now I’ve been doing it about four months, and I have to say there are good things about it that I didn’t anticipate. EYE: I think by nature many of us writers have a love-hate relationship with social media. PAM: Right. I was talking with this guy in Salt Lake today about Terry Tempest Williams, an old friend of mine who wrote so beautifully about the natural world. When I started writing about the natural world, it was very hip, and now it’s totally unhip. But it doesn’t matter. For me in this book I’ve tried to write about place, about landscape, and bring in other elements: space, music, …massage [laughs]…the New Age and stuff that’s always in my books like dogs and girlfriends and men who aren’t that great all the time. EYE: Of course the young folk take so naturally to all the new technology, but do you have concerns? PAM: I worry in terms of young people and attention spans. I’m not totally sure that it’s so bad to find out that there are three beluga whales trapped off the Cape on Twitter…or find out about a song by a new artist in thirty seconds. I think there’s a lot of good stuff about it. I’m worried in general about the absence of that ability to sink into a story, and their patience as writers and as readers. I don’t wanna come right out and say it’s the death of the novel, but it’s already changed things. But I don’t know that what will rise out of it will be so awful. Things change. We’re sort of at the peak of not liking the natural world, and I can feel a little bit of it coming back and that young people are wanting to write more about nature again. EYE: Talk to me about that. PAM: Well, the literary theorists are all talking about human ecology, ecology without nature. It’s all about urban structures, currency, the yen. It’s like painting; it just goes through waves. You don’t see as much as you used to of landscapey, western and southern motifs. It seems to me that when I came up, work from writers like Terry Tempest Williams and Richard Ford were the books people loved, and now its all about Goon Squad and these kind of urban books. EYE: Last question. What was your bravest moment in the process of writing Contents May Have Shifted? PAM: I think it’s really easy for me to write about these great girlfriends and then make fun of the guys. I don’t anymore, but I used to do it in the early days, saying things like, “Oh yeah, another guy let me down….” To write the main character, Rick, at least as the potential not to be that guy, was brave for me. Rick is loosely based on the man I live with. I changed him, disguised him a lot, but for some reason it’s really scary for me to say, “A guy is treating me really well.” There’s the truth. PAM: There was other scary stuff, but the hardest thing to say was, “Oh, there might be a guy who really loves me.” Even to say it to you is hard. Isn’t that interesting? EYE: Indeed. That’s very interesting. PAM: I don’t think I’ve ever had this conversation [laughs]. Nobody has asked me that question in quite that way. I think that it’s about not falling into my pattern which is that the girlfriends are awesome and they keep you going, and the guys are a disappointment. EYE: …very brave. I’ll just name it for you. EYE: Thanks so much, Pam. Just wanted to mention the part of the world where you live is breathtaking. Readers and fans of yours can take a peek on your Contents site. 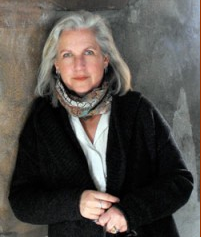 Anita Jones is a writer, visual artist and oral tradition storyteller. 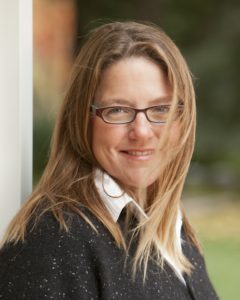 Her novel-in-progress, Peach Seed Monkey, was a novella semi-finalist in the William Faulkner-William Wisdom Creative Writing Competition. She’s the Executive Director of the Gaines-Jones Education Foundation, a family foundation she co-founded with her husband, Robert Roehrick. They live in northern California with their daughter. Contact Anita at peachseedmonkey@gmail.com.Visit her blog: peachseedmonkey.